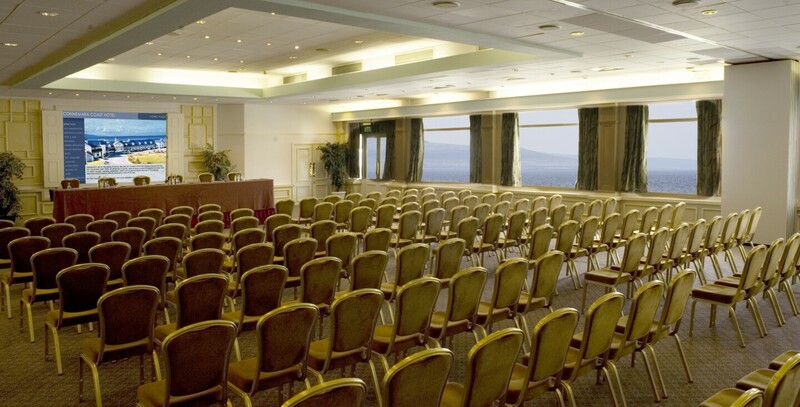 The Connemara Coast Hotel is an inspiring location for your conference or meeting affording fabulous views of Galway Bay and the Atlantic Ocean. Located on the Wild Atlantic Way, our hotel has 141 luxury bedrooms including the many amenities and services one would expect from a 4 star property. The Aran Suite is our main conference room and can accommodate all types of corporate events and our dedicated Team are on hand to deliver first class professional service. Our hotel is also located in what is known as the ‘Gaeltacht’, which is where Irish or Gaeilge is primarily spoken. With the heritage of the Gaeltacht, surrounded by the rugged landscape of Connemara, the breathtaking coastal route of the Wild Atlantic Way and Galway City on our doorstep, the Connemara Coast Hotel is the perfect choice for your important event. At this spectacular location, your conference will be hosted with both dedication and skill by our experienced team of professionals. Their warmth and friendly welcome too, reflects the confidence born of catering successfully for many important events. Aside from our standards of excellence, which are essential and fundamental to the service we provide, we also know too what it takes to keep conference delegates and their organizers happy. Attention to detail is all-important and that’s just one of the things we’re good at! So, let us introduce you to our hotel, a place that is unique and especially well appointed for the discerning Conference and Events Managers needs.